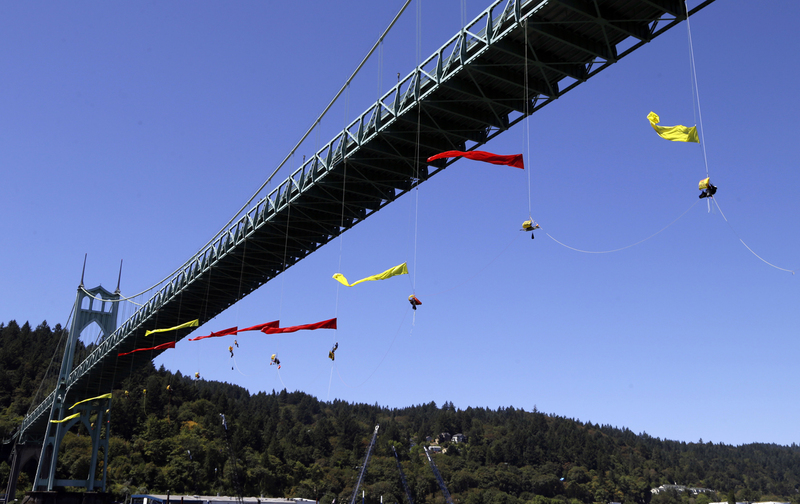 On Thursday, climate activists in the US began a week of direct action to “Break Free” from fossil fuels. It’s been almost two weeks since a wildfire broke out near Fort McMurray in Alberta, Canada, forcing the evacuation of 90,000 residents from the tar-sands boom town. Swathes of spruce and pine forest continue to burn, fueled by dry conditions that scientists link to climate change. With 2,400 homes and thousands of acres of forest destroyed, it will be a long time before the region recovers. But oil companies operating in Alberta have already resumed oil-sands production. It’s against that grim background that environmentalists around the world are staging a series of direct actions against fossil fuel–development projects, to make a statement that energy companies should not be allowed to carry on business as usual while the world burns. As part of this “Break Free” wave of action, some 10,000 Filipinos marched in Batangas City last week to demand the cancellation of a plan to build more than two dozen coal-fired power plants in their country. Activists in the United Kingdom temporarily shut down that nation’s largest coal mine. More than 60 people have been arrested in Australia for blocking a rail line used to transport coal, while dozens more formed a floating blockade made of kayaks, sail boats, and surfboards in the harbor. Thursday marks the beginning of a week of Break Free protests in the United States. Activists are expected at a Bureau of Land Management auction in Denver, Colorado, to protest the leasing of public land for fracking. The Pacific Northwest is preparing for a new wave of kayaktivism, in what is anticipated to be the largest act of climate-related civil disobedience ever in the region; hundreds of people have agreed to risk arrest in an attempt to stop the flow of oil from two oil refineries in Anacortes, Washington. In Los Angeles, the country’s largest urban oil field and the site of gas leaks that pose long-term health risks to residents, activists plan to gather at City Hall on Saturday to call for an end to drilling in the city and a move toward 100 percent renewable energy. In Albany, they’ll be blockading railways to call attention to the “bomb trains” that carry crude oil from the Bakken shale region of North Dakota to the city’s port. All of the Break Free actions are intended to highlight the disconnect between the commitment made in Paris last year to keep warming below 1.5 degrees Celsius, and continuing investment in fossil-fuel extraction and infrastructure. “We’re seeing so many horrific impacts of climate change already this year that call into question whether the commitments that were made are sufficient,” said May Boeve, the executive director of 350.org, which is coordinating a large coalition of local and national groups. As of April, 2016 is the hottest year on record, with March the 11th consecutive month to set a record high. Armed guards have been posted to water reservoirs in India, where 330 million people are suffering from a drought. New research suggests that devastating sea level rise from the melting of the Antarctic ice sheet could happen much sooner than expected. And yet the political discussion about climate change in the United States during the election will be mostly limited to whether it’s happening, rather than what more should be done. “There’s going to be an enormous amount of political pressure required for those agreements [made in Paris] to actually mean anything,” said Boeve. According to a study released this month by the Stockholm Environmental Institute, the most significant move US policy-makers could make to stay on track to keep warming below 1.5 degrees would be phasing out fossil-fuel production on public lands and waters. Doing so would reduce global carbon-dioxide emissions by 100 million tons per year by 2030, researchers projected, a reduction “comparable to that of other major climate policies under consideration by the Obama administration.” About a quarter of all the coal, oil, and gas produced in the United States comes from publicly owned lands, which are leased to energy companies for extraction. The Obama administration recently put a moratorium on the chronically mismanaged federal coal-leasing program while a review is underway, but climate groups have asked for a full stop to oil and gas activity, too. The civil disobedience taking place this month is both an extension and an expansion of the fight against the Keystone XL pipeline. While critics on the left and the right argued that the campaign against the pipeline was merely symbolic, Boeve said that the Obama administration’s rejection set “an enormously important precedent, globally.” She continued, “For every Keystone there are hundreds of other projects proposed…. We can use the Keystone decision as an example that yes, in fact, pipelines that continue the reliance on tar sands and other fossil fuels continue to drive climate change.” Keystone also sent a message that the climate movement could win against big energy companies. Inside Climate News reported recently that at least 20 planned fossil fuel–infrastructure projects—including pipelines, export terminals, mines, and power plants—have been canceled in the six months since the Obama administration rejected KXL, thanks partly to sustained local activism. There are other signs the energy industry is starting to feel its own heat. Exxon, reeling from accusations that for decades it deliberately deceived the public and its shareholders about climate science, has deployed lobbyists and lawyers to try to contain the fallout. A conservative dark-money group is spending at least $100,000 to publicly attack 350.org co-founder Bill McKibben, climate philanthropist Tom Steyer, and other prominent environmentalists. And in April, a federal judge in Oregon allowed an unusual lawsuit brought by 21 young plaintiffs against the Obama administration for climate inaction to go forward, in spite of requestsfrom the government fossil fuel–industry groups to dismiss it.